Millennials have a different relationship with politics than other generations. These young adults are less likely than previous generations to identify with either major political party. At the same time, far more Millennials lean toward the Democratic Party than the Republican Party. And they are the most liberal and least conservative of the four generations. Using Pew Research Center survey data, this chapter charts the political emergence of the Millennial generation in the past decade and highlights how they compare with Gen Xers, Boomers and the Silent generation. While growing political polarization makes the headlines, another trend is reshaping the modern political landscape. 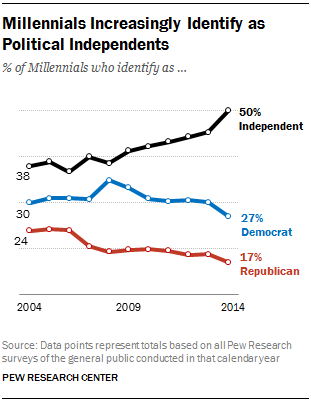 In the past decade, the share of self-described independents with no firm ties to either party has grown in every generation, but it has increased the most among Millennials. According to Pew Research surveys conducted in January and February of this year, half of all Millennials now identify themselves as political independents, up from 38% in 2004. Both parties have lost ground among Millennials in the past 10 years, though Republicans have lost somewhat more ground than Democrats. 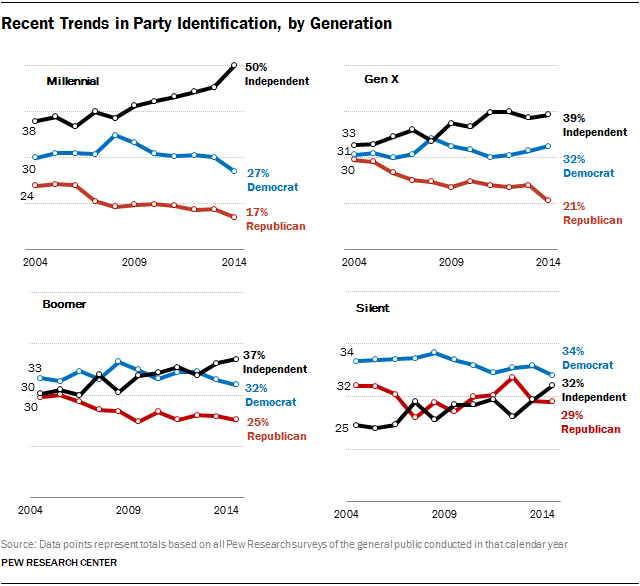 The proportion of Millennials who identify as Republicans has fallen from 24% in 2004 to 17% today. Democratic identification stood at 30% in 2004, rose to 35% in 2008 when young adults rallied behind Obama, but has since fallen back to 27% in recent polls. When the party leanings of independents are taken into account, the Democratic Party’s advantage among Millennials becomes more apparent. Half of Millennials (50%) identify as Democrats or say they lean toward the Democratic Party, 16 points greater than the percentage who identify or say they lean Republican (34%). 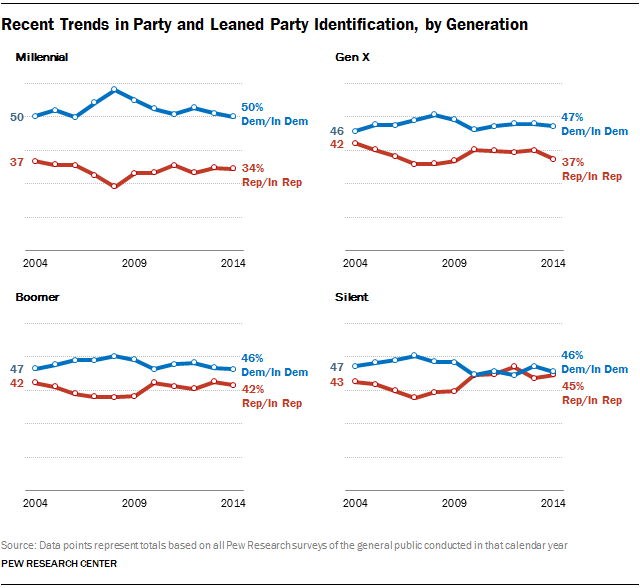 As with straight party identification, the Democratic Party’s advantage among Millennials on leaned party identification has narrowed since 2008; during that year, twice as many Millennials identified as Democrats or leaned Democratic (58%) as identified with the GOP or leaned Republican (29%). Among older generations, Democrats also have a wide advantage among Gen Xers; 47% are Democrats or lean Democratic while 37% are Republicans or lean Republican. 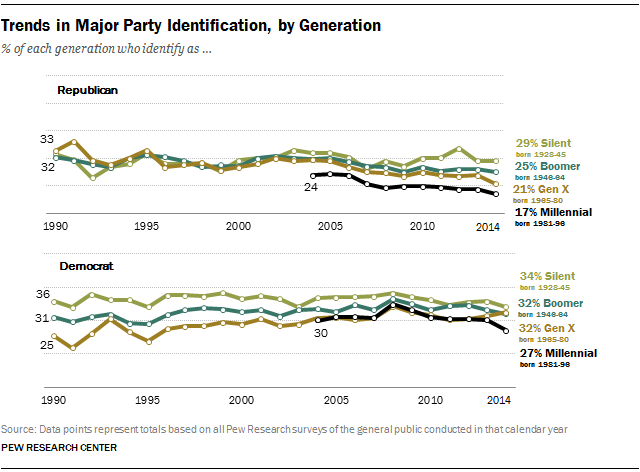 Boomers’ and Silents’ partisan leanings are more evenly divided. 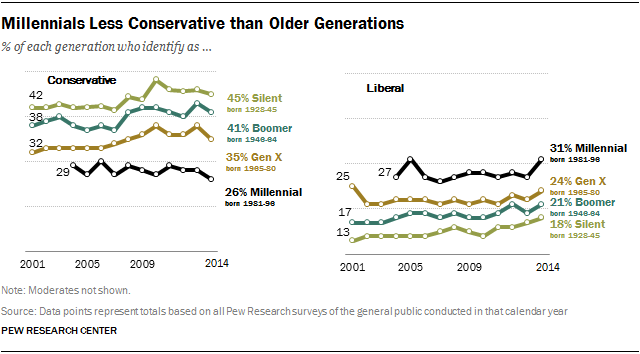 Over the past 10 years Millennials have remained the most liberal and least conservative of the four generations, and the only generation in which liberals are not significantly outnumbered by conservatives. In surveys conducted in 2014, 31% of Millennials say their political views are liberal, 39% are moderate and 26% are conservative. Millennials, like Gen Xers, are divided over whether their political views have become more liberal or conservative over the course of their lives. Among Millennials, 48% say their political views have become more liberal while 42% say they have become more conservative. 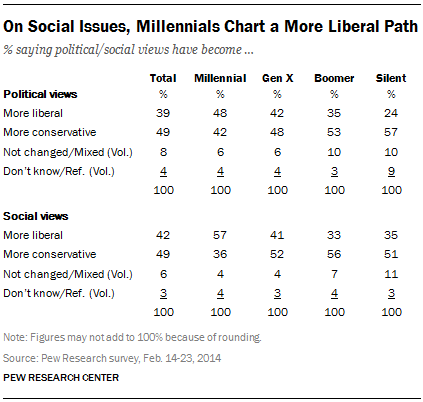 On social issues, however, most Millennials (57%) say their views have become more liberal. By contrast, about half or more in older generations—including 52% of Gen Xers—say their social views have become more conservative over the course of their lives. President Obama was swept into the White House in 2008 on a wave of support from young voters. 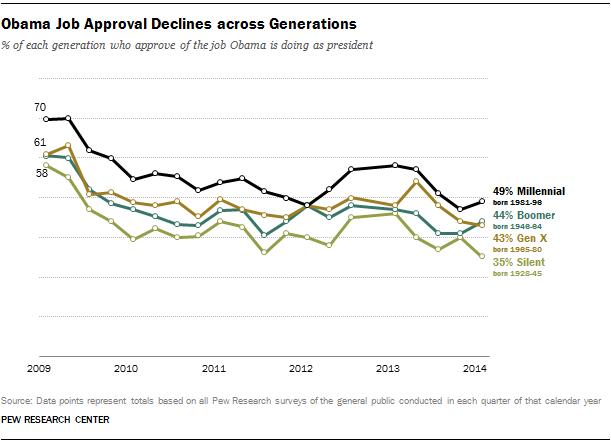 Yet within six months of taking office, his job approval rating began to slide among all generations. Among Millennials, Obama’s job approval has fallen from 70% in those first honeymoon months of 2009, his highest rating among any generation, to 49% in combined surveys from January and February 2014. The falloff has been about as steep among Silents (23 points), Gen Xers (18 points) and Boomers (17 points). Nonetheless, Millennials have a more positive view of Obama’s job performance than do older Americans. Currently, 49% of Millennials approve of the way Obama is handling his job as president, compared with 44% of Boomers, 43% of Gen Xers and 35% of Silents. 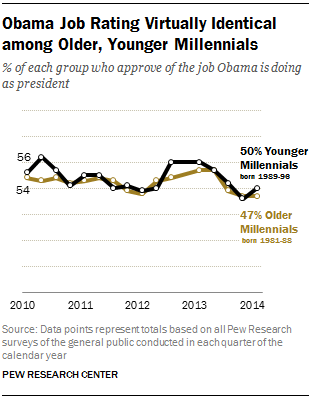 There is no indication that younger Millennials are any less supportive of Obama than older Millennials. Obama’s job rating is virtually the same among younger Millennials (ages 18 to 25) as among older Millennials (26 to 33). In surveys conducted this year, 50% of younger Millennials and 47% of older Millennials approve of the way he is handling his job as president. Since the beginning of 2010, there has been very little evidence of an age gap among Millennials in Obama’s job rating. Race and age have long been factors in opinions about Obama. Obama’s higher job ratings among Millennials throughout much of his presidency have been at least partly attributable to the racial and ethnic diversity of this generation. In 2012, 60% of all voters under 30 voted for Obama, according to national exit polls. But just 44% of whites in this age group supported the president’s reelection, while 51% backed Mitt Romney. In 2008, a majority of whites under 30 (54%) had supported Obama. Obama won overwhelming shares of the vote among young blacks and Hispanics in both 2012 and 2008. 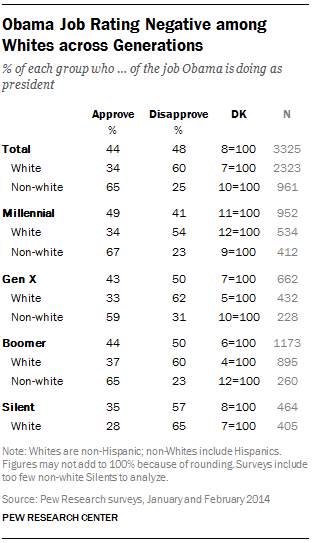 In 2012, 91% of blacks under 30 and 74% of Hispanics in this age group supported Obama. Positive personal reactions to Obama also have declined since his first term in office. Currently, 42% of Americans say Obama makes them feel proud, while 54% say this is not the case. In 2010, 49% said that Obama engendered feelings of pride and in November 2008, shortly after his election as president, 65% of voters said he made them feel proud. Four years ago, Millennials were more likely than older generations to say Obama made them feel proud; 57% of Millennials said this, compared with about half or less in the older cohorts. 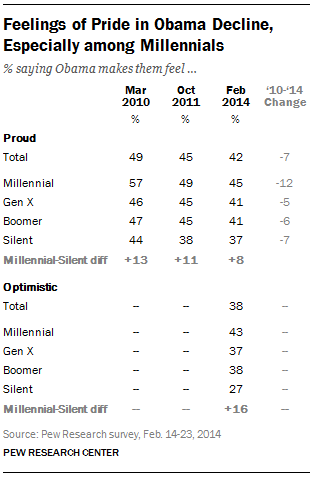 Today, 45% of Millennials and similar shares of Gen Xers and Boomers (41% each) say Obama inspires pride. Silents remain less likely than those in the youngest generation to say the president makes them feel proud. Millennials also are about as likely as Gen Xers and Boomers to say Obama makes them feel optimistic, while members of the Silent generation express less positive views. Half of Millennials, and majorities in older age cohorts, say that Obama does not make them feel optimistic. About half of all Americans (51%) say that Obama makes them feel disappointed, while 46% say he does not. These opinions have changed little from 2011, when 53% expressed disappointment with Obama. Millennials are less likely than older age cohorts to say they feel disappointed in Obama: 44% of Millennials express disappointment with the president, compared with half or more in older generations. Obama engenders more anger among older cohorts—Boomers and Silents—than among Millennials or Gen Xers. These views have changed little since 2010. Personal feelings about Obama, like views of his job performance, are divided along racial and ethnic lines. For instance, while a majority of non-white Millennials (61%) feel pride in Obama, just 32% of white Millennials agree. Those differences are reflected to varying degrees across older age cohorts as well. 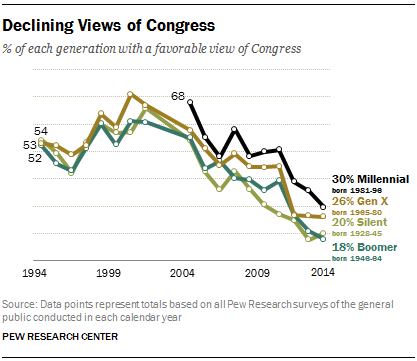 Favorable opinions of Congress have fallen sharply over the past decade across generations. 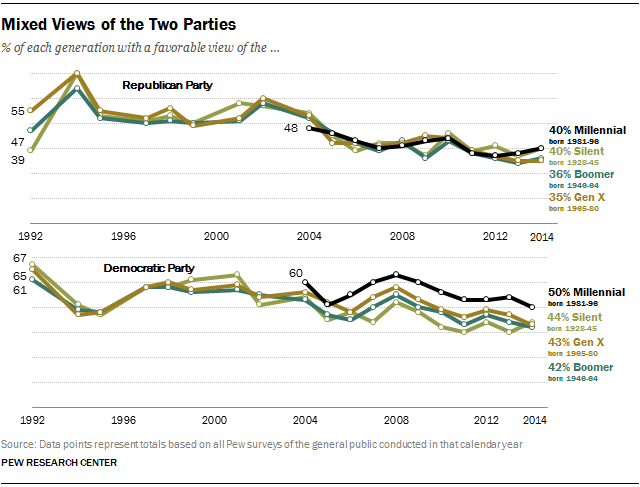 Among Millennials, for instance, just 30% view Congress favorably, down from 68% in 2004. 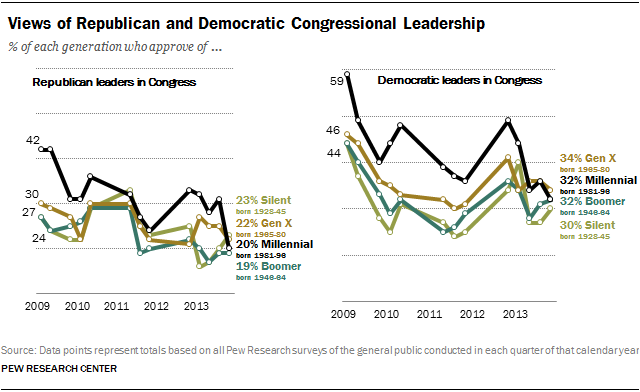 A slightly different pattern emerges on views of the Republican and Democratic congressional leadership. Ten years ago, Millennials were significantly more likely than other generations to approve of both Republican and Democratic leaders in Congress. Today, there is virtually no difference in the share of each generation that expresses approval of either party’s legislative leadership. Over most of the last decade, Millennials have expressed more favorable opinions of the Democratic Party than the Republican Party. In Pew Research Center surveys this year, 50% of Millennials say they have a favorable impression of the Democratic Party while 40% view the GOP favorably. Millennials express more favorable views of the Democratic Party than do older age cohorts. But in the current surveys, Millennials’ views of the Republican Party are about the same as those of older generations.